- Metallic gold jacket, highlighter yellow vinyl, scratch and sniff product sticker, standard weight. I like this album! Music first, but also the printed artwork and the yellow vinyl. It could have come in a gatefold. 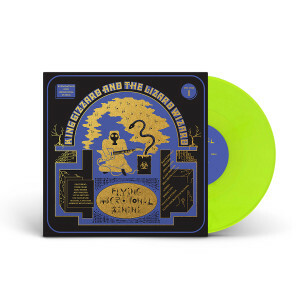 As usual KGATLW have found a way to renew their psych-songs. Microtonal is more than a trick. I can't wait to listen to the following albums! I work at HIFi Records in Astoria Queens, NY. Here's what I wrote for my shop's Pick of the Week in our newsletter! King Gizzard and the Wizard Lizard, a band that asks the question: How many ways can a face melt? The hodgepodge band of seven Melbourne, Australians are out again to rewrite the sonic landscapes of our time. Each of the numerous album they have released have been fresh and grand experiences. "Flying Microtonal Banana" takes it a large step farther. Frontman Stu Mackenzie was gifted a special microtonal guitar from a friend. The playable notes are made up of intervals smaller than a semitone creating some harmonically far out sounds. The band gave themselves a $200 budget to obtain their own 24-TET tuned instruments to jam out this truly conceptual record. The album, dedicated to the pursuit of Persian and Turkish music, employs microtonal guitars, basses, and even a microtonal harmonica, along with other traditional Eastern instruments such as the zurna and baglama. Like the heavy, stoner-rock, infinitely looping "Nonagon Infinity" preceding it, "Flying Microtonal Banana" flows seamlessly from movement to movement. The tracks have a meditative quality to them, giving the rhythmic complexity a back seat in order to flesh out the out-of-tune harmonic chaos. The prickly guitars of "Melting", the drudging thud enveloping "Doom City" and the classic King Giz freak out "Rattlesnake" highlight the band in their best form to date. "Nuclear Fusion" along with the title track closing out the record lean so far into the Eastern musical world that it slides down down down an endless dune of swirls and colours. You'll be straining to keep your third eye from blinking. The album is also awesomely packaged, complete with a special zine cataloging their journey through this album, as well as a banana scratch and sniff sticker! The Lizard Wizards have stated that this is to be one of 5 albums they will release this year, and if the "Volume 1" logo on the cover is any indication, we should be getting some more explorations in microtonal tuning in the near future! Theirs is a live show you really don't want to miss; dueling guitars, dueling drummers, harmonicas, and flutes beating the crowd into a fusion of chaotic rhythms. I'll be at Webster Hall with them on March 31st. Hope to see you there!